Hong Kong breathed a little easier this year as the number of hours of air pollution reaching “high health risk” and beyond fell by half the recent average. But much of the decline was due to wetter, windier weather in what are traditionally two of the most polluted months, January and October, according to a study by an environmental group. Hongkongers were exposed to 1,480 hours of air of high health risk this year, meaning “7” or above on the government’s 11-tier Air Quality Health Index (AQHI), when children, the elderly and those with heart or respiratory illnesses are advised to avoid physical exertion outside and areas with heavy traffic. About 3,559 hours were logged last year and 4,110 hours in 2014. The yearly average from 2014 to December 20 this year was 3,050 hours. There were also fewer days with high-risk air – 65 compared with 96 in 2014 and 79 in 2015. Green Power analysed data from the Environmental Protection Department’s 13 general air quality monitoring stations and found “major decreases” in hours of high health risk air in the city’s most polluted towns, including Tuen Mun, Kwai Chung, Yuen Long, Kwun Tong and Tung Chung. Abnormal weather may have been a major factor. Around 266mm of rain fell in January, 10 times the average of 25mm, according to the Observatory, possibly helping in the dispersal of pollutants. Hong Kong was also affected by five tropical cyclones in October, which brought windier and wetter weather. Rainfall was six times higher than the October average. Wang Tao, chair professor of atmospheric environment at Polytechnic University – who was not involved in the analysis – said weather and climate changes affected statistical metrics and definitely had a role to play in the drop, as there had been no major reduction in emissions. A department spokesman cited “efforts to improve air quality in recent years” including the gradual phasing-out of old diesel commercial vehicles, exhaust emissions controls and new laws requiring ships at berth to switch to low-sulphur fuel as playing a role. But Cheng stressed that air pollution remained stubbornly high in areas such as Tuen Mun, Tung Chung and Yuen Long, all of which had more than 40 days of high-risk air this year, often with ozone or roadside nitrogen oxide concentrations exceeding World Health Organisation safety levels. “With 65 days of high health risk air, one in every six days is a high health risk. We think this is still considered a serious issue,” said Cheng. The AQHI, which replaced the Air Pollution Index in 2013, categorises “1” as the lowest risk and a “10+” as the most serious. Levels of particulate matter in the air have risen to almost 80 times the recommended safety level set by the World Health Organization — and five times worse than Beijing during the past week’s bout with the worst smog of the year. Mongolian power plants working overtime during the frigid winter belch plumes of soot into the atmosphere, while acrid smoke from coal fires shrouds the shantytowns of the capital, Ulaanbaatar, in a brown fog. Angry residents planned a protest, organized on social media, on Dec. 26. The level of PM2.5, or fine particulate matter, in the air as measured hourly peaked at 1,985 micrograms a cubic meter on Dec. 16 in the capital’s Bayankhoshuu district, according to data posted by government website agaar.mn. The daily average settled at 1,071 micrograms that day. The World Health Organization recommends PM2.5 exposure of no more than 25 micrograms over 24 hours. In Beijing, the year’s worst bout of noxious smog prompted officials to issue the year’s first red alert and order 1,200 factories to close or cut output. Earlier this week, PM2.5 levels exceeded 400 in the capital, and Chinese officials on Tuesday canceled 351 flight departures because of limited visibility. The highest daily average in the past week, on Wednesday, registered 378. Worse, the PM2.5 reading in Shijiazhuang, capital of Hebei, exceeded 1,000 micrograms per cubic meter earlier this week, according to the China National Environment Monitoring Center. 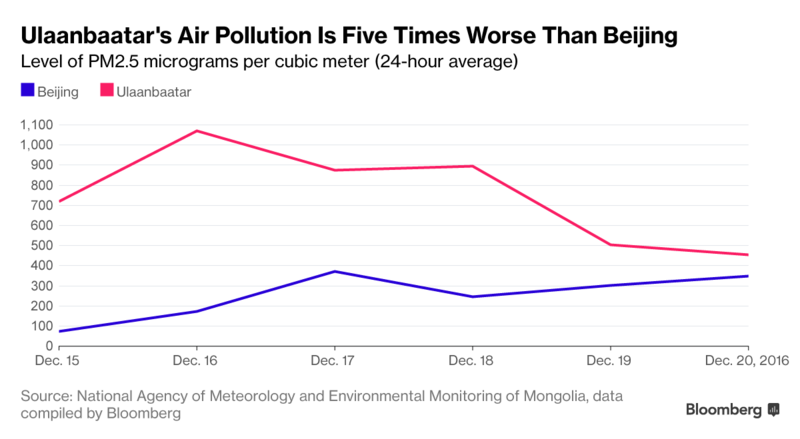 Mongolia’s contracting economic growth and a widening budget gap have left authorities few resources to fight the dangerous smog. After first cutting the nighttime electricity tariff by 50 percent to encourage residents to heat their homes with electric heaters instead of raw coal or other flammable material that is often toxic, Prime Minister Erdenebat Jargaltulga announced Friday that the tariff would eliminated entirely as of Jan. 1. Longer term, he proposed building apartments to replace makeshift housing using a loan from China, doing more to encourage electric heating, and reducing poverty to slow migration to the capital, according to a government statement. The conversion of ger districts, where hundreds of thousands of people live in makeshift homes including tents, into apartment complexes has so far been stymied by an economic crisis that has pushed the government to seek economic lifelines from partners including the International Monetary Fund and China. On Wednesday, Defense Minister Bat-Erdene Badmaanyambuu announced that a 50-bed wing of Ulaanbaatar’s military hospital will open up for children with pneumonia, as city hospitals were filled to capacity, according to a statement on the government’s website. Public anger over the government’s handling of pollution has been growing on social media, where residents share pictures of the smog, encourage methods of protection and call on the government to do more to protect citizens. The latest trend Friday had Mongolians changing their profile pictures on Facebook to show themselves wearing air pollution masks. The air pollution protest next week was being organized for Sukhbaatar Square, the capital’s central plaza. A crowdfunding campaign to purchase 100 air purifiers for hospitals and schools raised more than $1,400 in five days. Earlier this month, the United Nations Children’s Fund (UNICEF) warned of an impending crisis if the smoke levels are not reduced, calling children under 5 and those still in the womb the most vulnerable. A 2013 study by Canada’s Simon Fraser University concluded that 10 percent of deaths in Ulaanbaatar were related to complications from air pollution. Neither the ministers for foreign affairs nor the environment replied to requests for comment. Byambasaikhan Bayanjargal, who heads the Business Council of Mongolia in the capital, said he and his family try to stay indoors as much as possible and spend weekends outside the city. Friday’s PM2.5 levels in northern Ulaanbaatar peaked at 932 at noon, while the monthly average for December so far was 518. Meanwhile in Beijing, where the government lifted its pollution warning Thursday, skies were clear and air quality improved. I attended the Development Bureau’s second “public engagement” forum on December 18 on its “Planning Vision and Strategy Transcending 2030” ( or “2030 Plus”). I can attest that the public was not engaged, but patronised and stonewalled by the five government officials there, aided by a biased moderator. A Planning Department official consumed a quarter of the allotted time with a 2030 Plus presentation full of graphics and feel-good buzzwords like “smart, green, resilient city”, and “urban-rural-nature integration”. In concrete terms, these jaunty concepts boiled down to creating 1,200 hectares of land for two new towns, New Territories North and East Lantau Metropolis, involving large-scale reclamation, extremely high costs, razing villages and displacing their inhabitants. Understandably concerned, many in the audience sought specific answers during question time. They submitted their names to a lottery and, if drawn by the moderator, were permitted to speak. He drew 10 to 15 names at a time and grouped all their questions in one batch for officials to address. This ploy allowed officials to gloss over or simply not respond to many questions. I would like to look at a few of the questions they didn’t answer. What is the government’s cost estimate for the East Lantau Metropolis? Comprising 1,000 reclaimed hectares around two islands east of Lantau, this vast new city is likely to cost over HK$400 billion. Its feasibility study alone costs HK$248 million , the costliest such study in the history of our infrastructure. Why won’t the government release the five consultancy studies on the metropolis and Lantau? Why won’t it even disclose a 20-year-old cost estimate for a tunnel connecting Hong Kong Island to one of the two islands? This estimate is in a government study for a 1990s plan to build a new town on reclaimed land around Green Island; a similar tunnel is likely to be built for the metropolis. Why can’t the government acquire the land from brownfield sites, developers’ land banks, and the 900 hectares reserved under the small-house policy? Or why not terminate the lease of 163 hectares to the Hong Kong Golf Club in Fanling and use the land for public housing? A director of developer Hopewell said Hong Kong needed the golf course as Asia’s world city. Mindful perhaps that some audience members may live in subdivided flats, even the five officials remained silent on that score. Of the 30 audience members who spoke, 26 spoke against the government’s plans.